The Showtime series Episodes starring Friends' Matt LeBlanc will return in 2016 with a fifth season that is filming in London. On the show, LeBlanc plays an exaggerated version of himself and his sitcom alter ego Joey mashed up into one. The premise revolves around a married British comedy-writing duo, who came to the U.S. to produce an American version of their smash U.K. hit "Lyman's Boys." Matt plays the less-than-qualified actor they were forced to hire for the lead. The series is based on the real-life experiences of the Executive Producers David Crane (who created Friends) and Jeffrey Klarik (showrunner for Mad About You) and their dealings with misguided network executives. 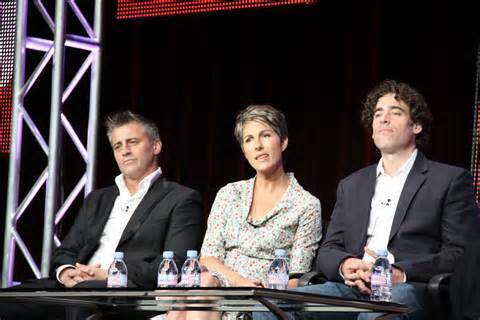 British actors Steve Mangan and Tamsin Greig play the writers, Sean and Beverly Lincoln, while the rest of the cast is filled out with familiar American faces. John Pankow (Mad About You) plays American television executive Merc Lapidus, Kathleen Rose Perkins ('Til Death) plays network exec Carol Rance and Mircea Monroe (Drive) plays Matt's one-time co-star Morning Randolph. At a press event, the actors discussed their characters and Matt talked about playing himself. In Episodes LeBlanc plays an egotistical actor that has every whim catered to, despite being the the brunt of many jokes that ring a little true. The actor remarked, "I was very flattered to be the punch line... I didn't mind being the punch line if it's a good joke, and I think in this situation I feel like in their hands it's always going to be a good joke. A punch line in a not so good joke, maybe not so fun." He continued that he was hesitant to play himself at first, "I didn't really understand what they meant by that and they assured me it was not a documentary and I would be fine and looked after. And once I got my head around that, it started to become really fun to push the envelope and poke fun at my alter ego, Joey, so that was fun. I had a really good time." He talked about how he approached the task of inventing a role based on his life. "I think any character is a challenge. I looked at this as any character. I didn't really look at it as playing myself. That frankly scared the hell out of me, so I looked at it as I looked at any other part that I played and that made it okay for me." So how does the TV Matt LeBlanc compare to the real Matt LeBlanc? He replied, "There are similarities, and there are differences between us. I think there's a gray area between us. The lines are blurred. I really think it would be more fun, for me anyway, to just not distinguish between the two and let people make up their own mind as to what's real and what's not real, and like I said, it didn't feel at all, ever in the playing of it, like I was playing myself... It's a character to me that they stole my name for it." John Pankow plays Merc, the TV exec who first begged the Lincolns to bring their show to the U.S. only to admit after they agreed, that he’d never even seen the U.K. version. Pankow acknowledged that it's fun to play the character, "It's like one of those parts that you just kind of dream of getting hold of... It's just a joy." But the actor was coy about revealing who he has based his interpretation on. "I think there's a little bit of Merc in all of us... Gordon Gekko and Yosemite Sam are my two inspirations for Merc Lapidus basically." He noted that the script makes creating the character easier. "This is one of those parts that's so beautifully written that I didn't really spend a ton of time - you play what's on the page and what's on the page is so good that... as it comes to you scene by scene, you go, 'Ahh, here's another gem and you dive in.'" If you ask most actors, they have dealt with a Merc from time to time. Mangan discussed his first encounter with U.S. Hollywood types, "The first time I came over here, I met some managers, and one of them said to me, 'You're going to be a huge star. I've seen everything you've ever done, Simon... ah, Stephen... yeah, Stephen.' So immediately you think, 'Hello, maybe he hasn't actually seen everything I've ever done.'" He continued, "But I'll tell you what. It's great to have all of the enthusiasm and encouragement because we don't get so much of that in the U.K. People are so much more dour over there." Greig divulged that this was her first U.S. acting gig so she was not as jaded. "I believe people when they say, 'You are fantastic,' and so that's really nice. So it's been quite difficult playing somebody like Jeffrey who doesn't believe you when you say, 'You are fantastic.' There's a phrase that I heard in the U.K. where they said, 'Hollywood is death by encouragement,' which I thought was wonderful. And if this is our demise, our death, it's a really happy way to go. Come encourage me some more. I'm loving it." Perkins, an American actress who has had numerous experiences with the Merc personality type confessed, "It was a pretty awesome thing to get the job, but then I thought, 'Oh, God, I have to play somebody who is basically the type of person who's been rejecting me for the last seven years of my career and find compassionate justification for what she does.' And it was really hard but fun. So I fell in love with her. And I feel a lot more for all of those executives out there. They go through a lot of crap." Monroe felt her character, Morning, was someone she aspires to be, "With playing Morning, she's more experienced than I am and more successful, and so I felt in some ways I was playing who I'd like to be. Being an actress, I obviously can relate to that, extremely. And I had to come to terms with some behavior traits that I didn't know I had that she also has... She has a loud laugh or whatever, might be a little annoying. Some people might not like her, but I quite enjoyed it and was able to draw on a lot of things in my life, I think, to play her, too, with the help of them." The character of Morning has deceitfully young looks although she is older than most people around her will admit. Monroe, who is herself much younger than Morning, stated that playing someone older was difficult to accept at first. "So Morning is in her forties... But that's probably my favorite... thing is just to be playing someone older, and how that person would act and be." To learn more about Episodes visit the show’s official website.